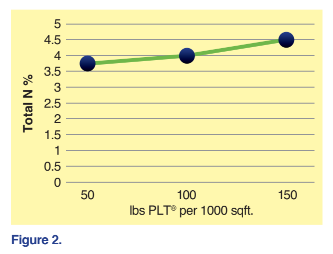 PLT® Increases Fertilizer Value of Poultry Litter – Jones-Hamilton Co.
rises farther above the nitrogen content alone. Using PLT® litter acidifier at placement to bind ammonia and improve flock performance also greatly increases the fertilizer value of poultry litter. 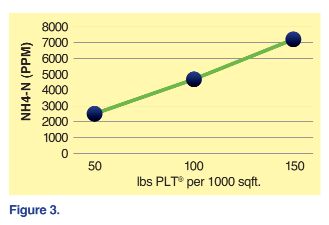 For every one hundred pounds of PLT® applied to a house, 55 pounds of ammonium sulfate is generated (see Figure 1). This formation of ammonium sulfate is non reversible. Therefore, the nitrogen in the litter is not released as the pH increases (Ullman, et al., 2004). Over time, this can double the ammonium nitrogen content of your poultry litter. The use of PLT® for ammonia binding will also improve the N: P ratio of poultry litter due to the retention of ammonia as ammonium sulfate. Based on current inorganic nitrogen costs, broiler litter is currently valued at $105 per ton based on its nitrogen content alone. In an unpublished study (Johnson 2003) of broiler litter from Northeast Georgia, sodium bisulfate usage for ten consecutive flocks increased the Ammonium-N to an average of 6809 PPM compared to an average of 2969 PPM of the untreated control litter. This greatly reduced the amount of supplemental nitrogen needed for fertilization. In a study conducted by Fairchild, et al. at the University of Georgia (Johnson et al, 2006) consecutive use of PLT® for three flocks showed a linear increase in both N and NH4-N retained in the litter as the amount of PLT® applied increased (Fig. 2 & 3). dilution due to the level of amendment added. Patterson, et al. (2006) recently completed a study in a high-rise commercial egg-layer facility to evaluate the use of PLT® litter amendment for the reduction of ammonia and flies. PLT® was applied either at the rate of 200-lbs./1000 sq ft. or 400-lbs./1000 sq ft on eight separate occasions during two 45-day experimental periods on a central row in the pit area of the house. A third row was left untreated as a control. Because layer manure does not contain a plant substrate, as does broiler litter, the moisture and ammonia content tend to be greater. Repeated applications of a litter amendment at higher rates are often necessary before significant changes in manure characteristics are observed. The same observations were made in this study where the higher rate of PLT® showed the most consistent decrease in ammonia emissions (ppm/sec) with emission rates significantly lower than the control on three out of the five sampling periods (0.2178, 0.8394, and 0.6435 for the high-treated vs. 0.6140, 0.9883, and 1.1863 for the controls respectively). Similar results were seen for the rate of Ammonia Linear Flux (mg/cm2/min). As in the UGA study, manure ammonium (NH4+) nitrogen and P2O5 were positively altered by treatment group with the high-rate treatment group having the highest level of retained nitrogen and the lowest level of P2O5 (figure 4). All of these studies confirm that PLT® greatly increases the fertilizer value of poultry litter and helps to bring the N:P ratio back into proper alignment. When added to the increase in bird performance and fuel savings generated from PLT® usage each flock, this is one more reason to treat your litter each and every flock regardless of the season. Patterson, P., T. Cravener, C. Myers, G. Martin, and A. Adrizal. 2006. The impact of sodium bisulfate (PLT) on hen manure, ammonia emissions, and flies. Proc. 2006 SPSS/SCAD Annual Mtg. Atlanta, GA. 33. Johnson, TM, B. Murphy, R. Chick, B. Fairchild, and CW. Ritz. 2006. The Use of Sodium Bisulfate as a Best Management Practice for Reducing Ammonia and VOC Emissions from Poultry and Dairy Manures. Proc. International Workshop on Ag. Air Quality. Potomac, MD. 786-794.